A surgical procedure that removes part of the front of the larynx. Typically, a hemilaryngectomy is done in order to remove a cancerous growth. This procedure was once the primary treatment option for medium and large vocal cord cancers that could not be removed by endoscopic (through the mouth) laser. Today, when laser cannot be used because of patient preference or anatomical difficulty, chemotherapy and radiation therapy are usually attempted first. The biggest role for hemilaryngectomy now seems to be for carefully selected tumors (in the earlier stages, T1 through large T2) that have persisted or recurred after initial treatment of radiation therapy with or without chemotherapy. In a hemilaryngectomy, the surgeon removes part of the thyroid cartilage, including the underlying vocal cord or cords. The extent of removal varies from procedure to procedure. In fact, the term “hemilaryngectomy” is somewhat misleading; “hemi” means “half,” but most hemilaryngectomies remove much less than half of the larynx. A very minimal procedure might only remove most of one side of the thyroid cartilage with the underlying soft tissue but not touch the arytenoid cartilage. On the other hand, a very extensive procedure might remove most of both sides of the thyroid cartilage, leaving the patient with only one arytenoid. Many other procedures would fall on a spectrum between these two extremes. Hemilaryngectomy, with standard (unmodified) epiglottic reconstruction. Panoramic view. Right true cord (left of photo) with arytenoid and anterior left true cord have been removed. The right arytenoid mucosa (left of photo) flops anteriorly because the arytenoid cartilage that would lift and stiffen this mucosa is gone on that side. Epiglottis remains in its original position, with petiole (P) opposite asymmetrical arytenoid mounds. 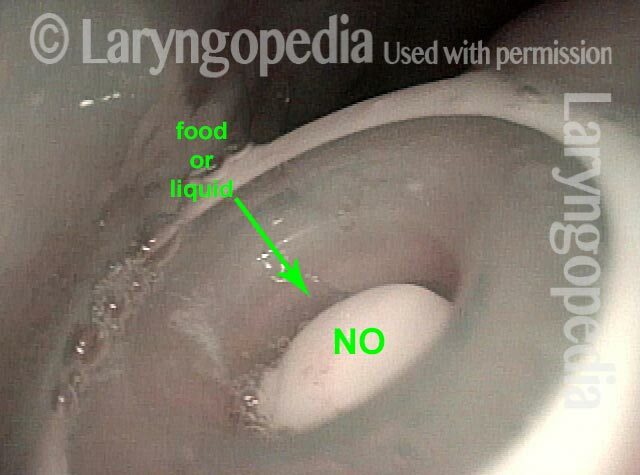 Close up view of interior of larynx during quiet breathing. The vocal process of left arytenoid (right of photo) by "V" and the petiole of the epiglottis by "P". 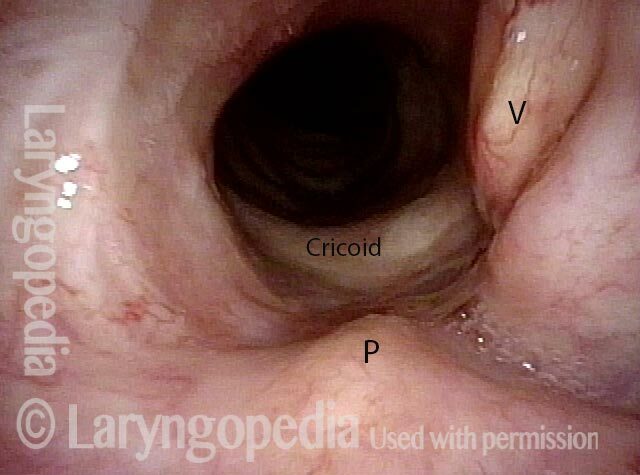 The upper rim of the cricoid is labeled as well. During phonation, the vocal process swings medially but there is nothing at the vocal cord level available to vibrate. Instead, arytenoid and aryepiglottic fold mucosa is pressed into service. These tissues are seen vibrating (blurred) here in order to produce a rough “Wolfman Jack” voice quality. Compare with photo 1. Panorama of the laryngopharynx in a patient with post-radiation persistence of glottic cancer at the anterior commissure, prior to salvage hemilaryngectomy. Note here the still-normal anatomy: in the foreground, the epiglottis and its characteristic shape (green dotted lines), and in the background, the partially abducted vocal cords (blue dotted lines) occupying part of the glottal space. Same patient, after hemilaryngectomy with modified epiglottic laryngoplasty. Compare with image 1. Dotted lines indicate where the margins of the vocal cords once were. Note that, to compensate for the removed vocal cords, the epiglottis has been pulled down and folded (arrows) so that the aryepiglottic cords can more easily vibrate together as a sound source during phonation. Back to the patient’s pre-hemilaryngectomy exam, but with a closer view than image 1. The tips of the vocal processes are indicated by green dots. In the foreground, note (as in image 1) the normal shape of the epiglottis, prior to being surgically pulled down and folded. Back to the patient’s post-hemilaryngectomy exam, but with a closer view than image 2. 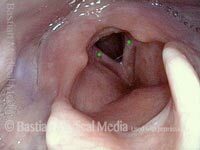 The tips of the vocal processes (now exposed by the absent vocal cords) are again indicated by green dots. Compare with image 3 to see the anatomical changes created by the hemilaryngectomy and epiglottic laryngoplasty. The petiole of the epiglottis has been sutured to the cricoid cartilage, at the dotted line. Still post-hemilaryngectomy, during phonation. 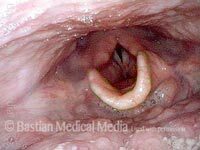 The vocal cords have been removed and can no longer be the sound source, but the modified epiglottic laryngoplasty has enabled the aryepiglottic cords and apical arytenoid mucosa (blurred due to vibration here) to serve as a substitute sound source. 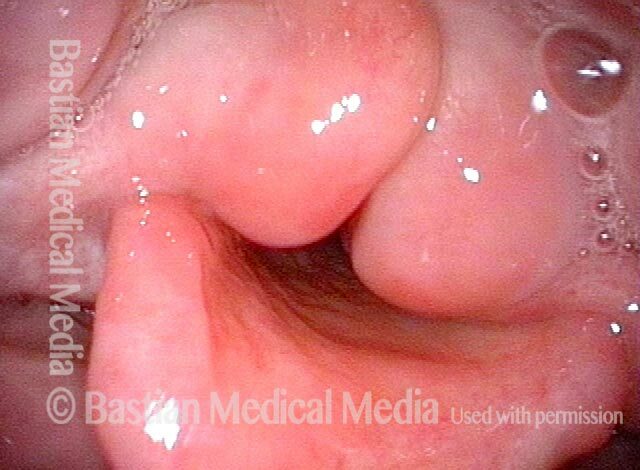 Closer view of phonation with the aryepiglottic cords and apical arytenoid mucosa. After removal of the anterior larynx (hemilaryngectomy) for cancer that recurred after radiation therapy. Though not well seen here, the vocal cords are surgically absent. The black dot seen is for orientation to the next photo. A = arytenoid; E = epiglottis. 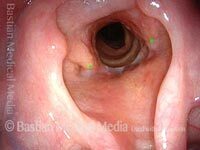 A view within the larynx. Note again that vocal cords are surgically absent, with only the arytenoid cartilages remaining at the level of the cords. The black dot, on the left arytenoid cartilage, orients to the prior photo. The dot is on the right vocal process. The patient is about to produce his rough, “Wolfman Jack” voice but the arytenoid mounds have not yet started to vibrate. Aggressive voice use brings arytenoid mounds into vibration (notice blurring). With time and practice, this kind of supraglottic voice can serve moderately well, but it is always difficult to be heard in competition with background noise. 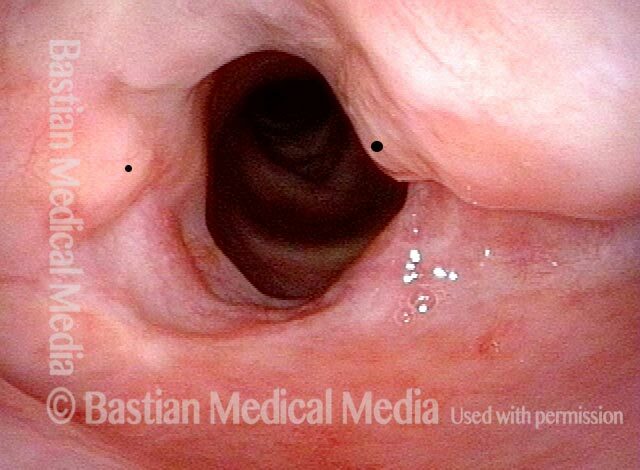 This view is just inside the upper esophagus in a man who has undergone laryngectomy. The white-edged “disc” at the bottom of the photo is the inner flange of the TEP device. The arrow points towards the valve just inside the flange. This valve says “no” to any food or liquid that wants to pass in the direction of the arrow and into the trachea (not seen here). Here, we see the flapper valve more clearly. Again in its “closed” position, it will not let food or liquid enter. Now we see the flapper valve lifted out of its housing. The patient is placing his thumb over the tracheostome (not seen here) and diverting air through the TEP device and into the esophagus. The esophageal walls are brought into vibration to produce continuous, pulmonary air-powered esophageal voice. This entry was posted in Multimedia Encyclopedia and tagged Photos, Treatment, Voice & other larynx disorders by admin. Bookmark the permalink.